Others who know more will be along but the logo looks like it is a PCM product. The Electra brand was sold by two different companies, PCM and SLM that were owned by brothers. The PCM ones are poorly documented and vary greatly in quality. From the looks I would guess an very early SLM Electra model. The headstock I would say is from the 1972-1974 range as is the logo. This color is not seen as much and mostly on the early models. Looks to be an early Super Rock model but would need pics of the neck joint and close ups of the tuners etc. Nice looking guitar.Welcome to forums. I'm thinking it's one of the "unknown" distributor models. There was an article written on how there was a company (not SLM or PCM(mostly 60's & early 70's) that began putting out some models the early 80's using the Electra name, and it was part of why SLM transitioned to the Westone branding. When SLM and PCM used this logo, their headstocks were all fairly direct copies of "real deal" headstocks. not until they started to go to the peace sign logo did they start with some of the "unconventional" headstocks. The "unknown Electras" from the 80's had headstocks all over the place... They seem to be put out from about 82-90 it seems when comparing the "unconventional" headstocks to brochures for other makes that utilized the exact smae neck and odd headstocks. I'm still gathering photos for an identification guide. this is a headstock I've not seen before. 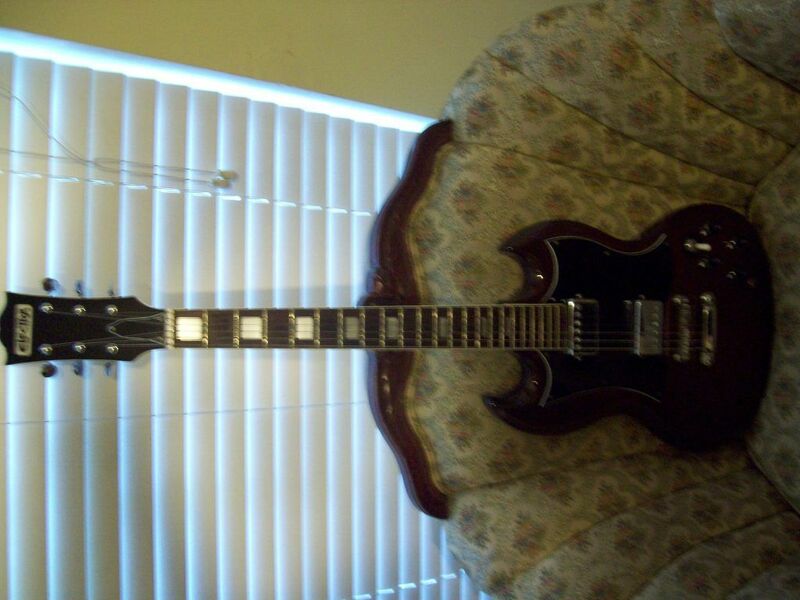 Here is a photo of my 1972 Electra SG(laminated body) models and it is similar but not exactly the same. Hard to judge with these headstocks and models etc. Hope thetobucket.comse help as I have never seen this color and headstock combination with the script logo and diamonds all in one. I was thinking along the lines of what McBrat wrote when I looked at the pics. It was not anything like the PCM stuff we have seen, it didn't look much like any SLM stuff even the pre-catalog stuff we have seen. I am leaning towards the other maker theory. Some have speculated that this other maker might have used Korean factories for their products. The only head scratcher for me is the diamond inlays on the headstock. I have not seen those before on one of these unknowns. This is another one of these unknowns I believe. In regards to what Mcbrat and yyzrondo wrote, I read something similar. I remember reading that the other maker used Korean factories and that these factories possibly printed serial numbers on a sticker and placed them on the back of the head-stock. I don't know if that is true, but most likely it is. Here are some more pics of my Electra, as requested by Mortarman. by the way, nice Electra Mortarman!! And to make matters a bit more challenging, here is the pic of the Hondo II with similar head-stock and with similar diamond cut inlays I found on the net. Well no matter where or when it was built, best question is how does it play? How are the electronics and pick ups? Are you happy with it? Welcome to the forums! Hope you stick around and join in. I really like the guitar overall, it doesn't play great right now since the input jack is malfunctioning. I had the guitar for over a year, I just decided to find out more about it. A friend gave it to me when he got it after buying a storage unit. It was in a really bad shape as if someone stored it in a very humid environment by the looks of the case. I knew nothing about Electra guitars then, now I'm learning even more about them. Thanks for the welcome, I will def stick around!! Very nice Guitar and has the same style tuners as my early SG. Is the body solid or laminated(aka multilayer plywood)? My Sg is laminated in several layers but plays as nice as any solid body and has great tone. Does look a lot like the Hondo and it is also possible that it was manufactured at same plant as the Hondo but badged as Electra. 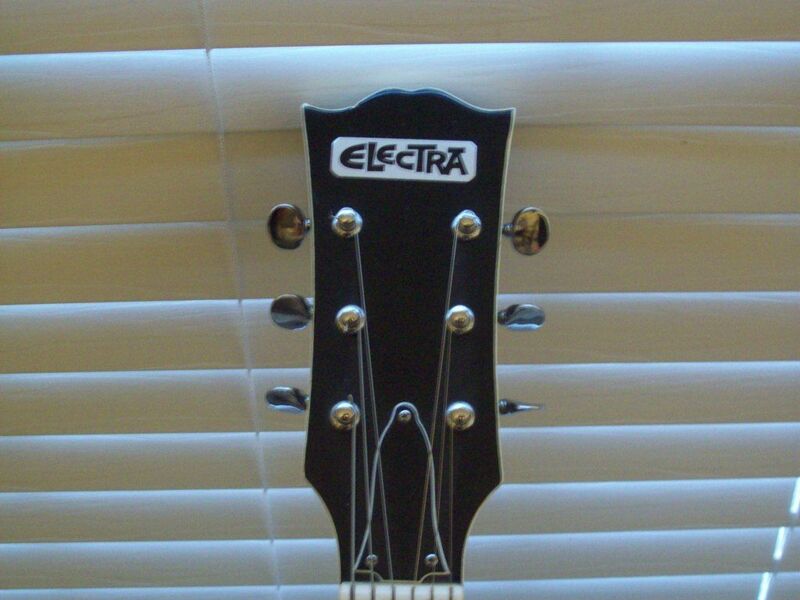 I have seen the diamond style logo with that Electra script logo on one of the older Electra SG Custom models. Still a great looking guitar and should play great. Congrats and welcome to the Forums. Thanks mortarman!! I don't know how to tell if my guitar is solid body or laminated. Any ideas where I can look? Thanks!! The idea of another distributor using the Electra name and that causing SLM to change its name does not make much sense. SLM/PCM owned the name. If someone else was using it, they would have their lawyers slap a cease and desist order on them. Think of how Rickenbacker gets on peoples' case for even say "Rick copy". Best way to check on the body is to remove the control cavity cover and look inside. From there you can tell if it is one solid piece, 2 piece, or several ply(layered laminated pieces glued together to form a solid body. Will look like a piece of plywood. The laminate bodies are Not a bad thing,Hondo used them a lot. If it is laminate then it could have came from the same maker as the Hondo 2s (thats a dead match on the head stock photo). The Hondo 2s were an effort to get in the higher end market. Back with the pointy guitars (hair metal) these were seen often being used by the up coming groups on MTV videos and thru out the guitar mags at the time.